Alba Botanica is one of my go-to brands for beauty products! I absolutely love their shampoos and conditioners, and they have an amazing sunscreen too! 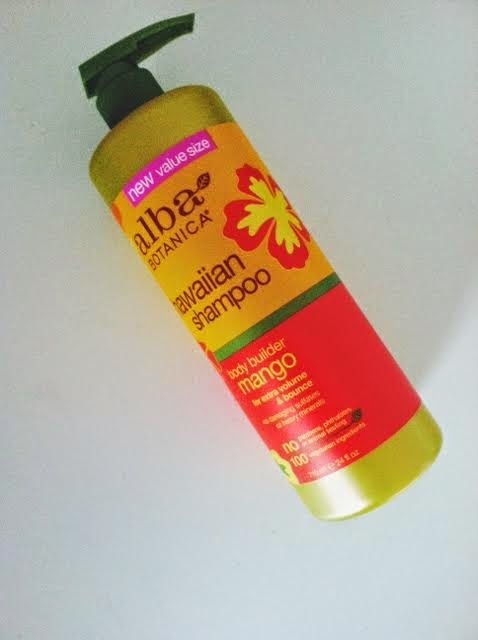 I picked up their Body Builder Mango Shampoo, and I love it! It smells so wonderful, and really helps with the volume of my hair! When using this shampoo don't expect it to get all sudsy and bubbly! This shampoo is free of harsh chemicals that include sulfates, heavy minerals, and has 100% vegetarian ingredients. When washing my hair, I only wash my scalp, and then condition my ends. I am not big on washing my hair everyday, and normally wash it every other day. Their shampoo doesn't leave my hair oily either, and I don't feel like my roots have a lot of buildup either. Another plus to Alba Botanica's brand is NO animal testing - which is another great reason to try their products! Hello friends! I want to know that how I can buy alterna shampoo online as this shampoo suits my hair. My hair looks very fluffy and rough If I don’t use it. Please help and send you valuable reviews as on physical stores its price is really high!